If you’re looking to purchase new practice putting green cups and flags for your course, shop the selection at PushNPutt. Our patented flagsticks are the world’s only interactive products and the most innovative in the golf industry over the last fifty years. No matter your age or ability, our flagsticks are the perfect way to improve your putt. Unlike traditional flags and cups that sit stationary at the end of every hole, our PushNPutt flagsticks offers golfers a new experience. When it’s time to retrieve your golf ball, simply push down on our patented flagsticks. Our innovative product lifts the cup to meet the putting green surface, and evenly disperses golf balls onto the green. There’s no need to add extra stress to your back and knees. Simply push, then putt! Increase your putt time, minimize stress to your joints and keep your practice area pristine. Our flagstick stays put in the cup, but can be removed easily if necessary. Our patented design also prevents golf balls from falling back into the cup. 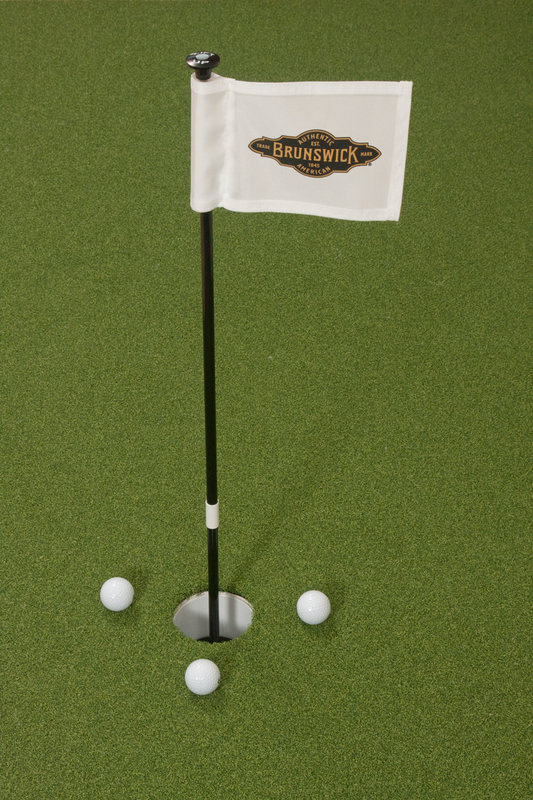 Our revolutionary practice putting green cups and flags will set your course, backyard or indoor practice green apart from all the others. And with our custom embroidered flags, you can add even more flair! When you purchase a genuine PushNPutt golf flagstick, you can be sure that you’re getting the highest quality materials available today. Made from high-quality powder coated stainless steel and outdoor plastics, our flags are tested and proven to withstand all conditions. Custom flags, colors and finishes are available to create a truly custom product. All of our flagsticks are made in our North Carolina factory and are backed by a one-year warranty. When you’re ready to go with the best, go with PushNPutt. In addition to improving the putting experience for golfers, course superintendents are also fans of our patented design. That’s because in addition to increasing putt time and removing the need to bend over to retrieve golf balls, our flagsticks also protect the putting green. Despite high traffic, our flagsticks makes it easier and faster to retrieve golf balls, lessening the impact of high foot traffic on the putting surface. When some golfers don’t want to bend down to retrieve their golf ball, they also resort to digging out their golf ball with their putter. This damages both the cup and the surrounding turf. Protect both by using our practice putting green cups and flags. Our product will provide you with a return on your investment! When you’re ready to purchase high quality PushNPutt brand practice putting green cups and flags, shop the selection online. In addition to our original model, you can also choose from the LiftNPutt and the PutterUp options. Instead of gently pushing down on the flagstick to raise the golf balls to the putting surface, simply lift up! The mini PutterUp model features a handle on the top of the flag that can perfectly accommodate a putter head. Just lift up gently and get back to putting!